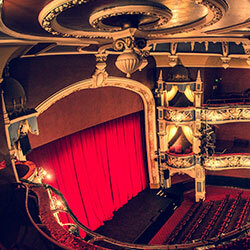 The Crewe Lyceum Theatre is the ideal South Cheshire venue for corporate conferencing, presentations and meetings. The Grade II-listed auditorium is the largest tiered lecture space in the region, seating 677 people with a fantastic view of your presentation on-stage. With state-of-the-art staging, a convenient location for road and rail links, and expert technical and event support available from start to finish, there's no better place to host a stress-free conference, product launch or meeting in Cheshire. Our flexible packages can be tailored to suit your needs. The Lyceum Theatre is an accessible venue. All front-of-house areas can be accessed via elevator. The auditorium stalls are wheelchair accessible, and the auditorium can be configured to seat up to 26 wheelchairs for a presentation or event. Hearing loops are available in all levels of the Theatre. The Lyceum Theatre's front of house spaces can be configured on all three levels to the style of meeting or presentation you require. The Lyceum Theatre's Edwardian auditorium is the centrepiece for any large conference or meeting and the perfect space in South Cheshire for large-scale presentations, product launches or events that have real impact. The Theatre auditorium can be hired for daytime or evening events and comes with the support the theatre's industry-leading technical team. The Theatre stalls are wheelchair accessible and have WiFi access. The Lyceum Theatre's Circle Suite is a private, modular space which can be used for presentations, meetings or break-out sessions and arranged to suit your requirements. 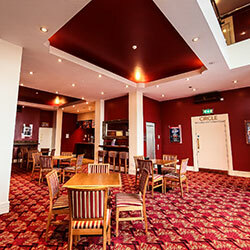 The Circle Suite can be hired independently from the auditorium for your event. Refreshments can be served in the Circle Suite or enjoy dining in the restaurant. Private entertainment, including comedy and cabaret nights, can be arranged in the Circle Suite after your working day is complete. The Circle Suite is wheelchair accessible, air conditioned and has WiFi access. The Head Chef and in-house team at the Lyceum Restaurant are available to provide a selection of lunch or buffet options to suit the needs of your event or guests. Dining in the Lyceum Restaurant is available for up to 40 seated or the space can be configured to serve buffet or grab-and-go options as part of your package of events. The Lyceum provides competitive day delegate rates and conference packages, with hire of the auditorium starting from just £500! Find out more about our different packages or contact us today to have us put together a custom meetings or events quote to suit your needs. A conference or meeting at the Crewe Lyceum includes catering in our Lyceum Restaurant by our in-house chef. View the menu options below or contact us to find out more about how we can customise your package to make your next event shine. Additional menu choices are available for your event. Our hospitality team can work with you to create the dining experience that matches your brand's exacting standards with service in the Lyceum Restaurant, or view our additional menu options for buffet options that work for every budget. You can hire additional equipment for your conference, or contact us to find out more about providing additional technical support.